If you are one of the some who like it hot, enter your favorite "Spicy Holiday Heat" recipe for an appetizer or dessert in the contest and perhaps win a stay in St. Augustine, America's oldest city. • your prize-winning recipe into one of the restaurant's menus. You must be 18 years of age or older to enter and all recipes become the property of Hot Shot Bakery and will not be returned. 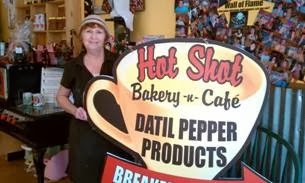 Judging will be done by Sherry Stoppelbein, owner of Datil B Good and the Hot Shot Bakery. 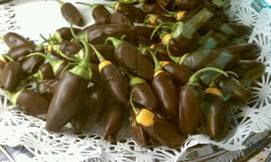 Send your Spicy Holiday Heat recipe via email to Leigh Cort Publicity, leighcort@bellsouth.net by Dec. 30, 2013. Winner will be notified by January 15, 2014. Sherry's already come up with the recipe for Chocolate Covered Datil Peppers.